1932 was a banner year for horror movies. Released in that year were: "The Old Dark House", "Murders in the Rue Morgue", "Freaks", White Zombie", "Vampyr", and our movie, "The Mummy" In addition, "Frankenstein", released in November 1931 was still going strong at the box office. In searching for a new property the producers at Universal looked to two sources; one was a story titled “Cagliosto”, about an alchemist who achieves immortality. The other was the public’s continued interest in the 1922 discovery of the tomb of Tutankhamen, and the supposed “curse” which followed the members of the expedition. These pieces were re-formed and shaped into a story about a 3700 year old mummy who returns to life and attempts to reunite with his long lost love. 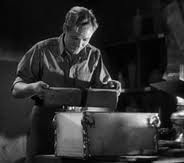 The screenplay was written by John L. Balderston, who seemed to be everywhere in horror in those days – he co-wrote the play on which the movie “Dracula” was based, and he contributed to the screenplay for "Frankenstein". He also happened to be a newspaper reporter in 1922 and covered the King Tut story. 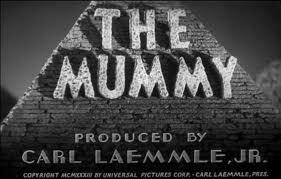 The plot starts in 1921 at the British Museum field expedition camp, where Sir Joseph Whemple has unearthed a very unusual mummy - Imhotep. The body was not prepared in the prescribed manner, the internal organs are intact, and he appears to have struggled in the bandages. 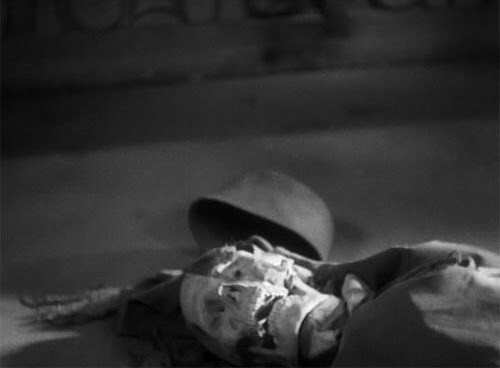 He was buried alive and his soul cursed, doomed in this life and the next. We see the full figure of the mummy for only a few tantalizing moments, and so don’t have much time to appreciate Jack Pierce’s extraordinary make up covering Karloff. 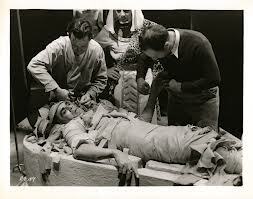 After this scene, we don’t see the mummy again. Buried with him is a box containing the Scroll of Thoth, an ancient document which contains “the great spell with which Isis raised Osiris from the dead”. Occult expert Dr. Muller warns Whemple of the curse which will strike anyone who opens the box. Muller is played by Edward Van Sloan, who also played the wise Prof. Waldman in "Frankenstein:, and the know-it-all Van Helsing in "Dracula". We all know by now that if he tells you not to do something you ignore him at your peril. 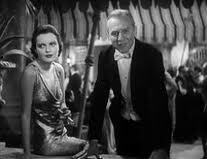 To his enormous peril, Ralph Norton, Whemple’s assistant does exactly that. Director Freund does a brilliant job building the tension here, in one of the most unforgettable and classic scenes in horror. The camera moves gracefully around the casket as Norton examines and finally opens it, removing the Scroll. 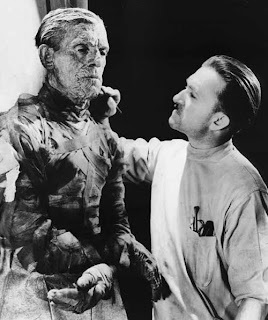 It glides back to the mummy, then back to Norton as he translates the spell and reads it softly. Cut back to the body- we see slight movement – almost imperceptibly the eyes start to open, and we see a glimmer of life in them. The arms slowly start to move, tearing away the rotted linen. Back to Norton still reading the spell. Next, we see the Scroll on the desk, and a horrifying bandaged hand slowly touching it. Norton looks up to his right and screams. As he backs away the camera stays only on him. His laugh starts quietly and builds until it is a madman’s shrieking hysteria: “H-h-he went for a little walk! !” Of the mummy the only other thing we see are his bandages trailing out the door. We then move forward to the 1932 British expedition. Frank Whemple, Sir Joseph’s son has failed to make any great discoveries. Providentially (? ), he meets Ardath Bey who offers to show him where to find the tomb of the Princess Ankh-es-en-amun. Bey is actually Imhotep, now looking more human, but gaunt and stiff, his skin as dry and wrinkled as parchment. It is a slightly less spectacular make-up effect, but terrifyingly real. The contents of the tomb are put on display in the Cairo Museum, where we see Bey gazing at the princess’s mummified body. He uses the Scroll to try to revive her, but fails because her soul has been reincarnated into a modern woman, Helen Grovenor. She is played by the beautiful stage actress Zita Johann. Her exotic look fits the character perfectly. But the intelligence, depth and wit she displays are an uneven match for her love interest, Frank. He is played by our old friend David Manners who is once again a pretty but pretty useless hero. Mr. Manners plays him as a callow, dull straight arrow. When he describes opening the princess’s tomb, handling her things and unwrapping her, Helen asks sadly, “how could you do that?” His soulful and thoughtful answer? “Had to…science you know!” It really makes you root for Imhotep. At least he would have been a much more sophisticated and fascinating dinner date. One of the least believable things in the movie is that she falls in love with Frank, and so quickly! 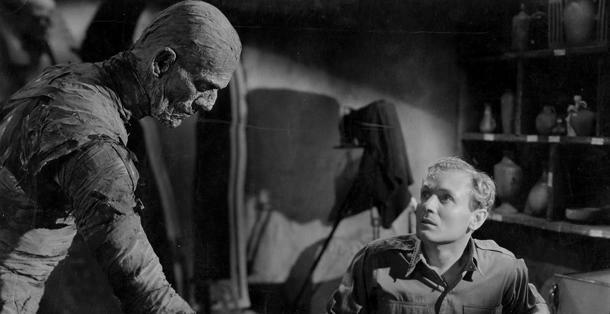 Ardath Bey/Imhotep realizes that Ankh-es-en-amun’s soul resides in Helen’s body, and lures her to his home, where he shows her a vision of their past lives and deaths. Ankh-es-en-amun was the pharaoh’s daughter and a priestess of Isis. She and Imhotep were in love. After her death, he used the Scroll to raise her from the dead and was buried alive as punishment for this sacrilege. The scene of Imhotep being wrapped alive, struggling in panic as the bandages are wound over his mouth, with his eyes wide in un-imaginable terror as the bandages cover them forever is pure nightmare fuel. At this point the movie starts to resemble a love story rather than horror. Ardath Bey plans to use the ancient spells to mummify Helen’s body and bring Ankh-es-en-amun back to live with him for eternity. “No man has ever suffered as I did for you”, he tells her in what may be the understatement of the last 3700 years. As Peter and Dr. Muller arrive to save her, Helen wakes from her trance and falls to her knees at the foot of the statue of Isis. She begs the goddess to forgive her for breaking her ancient vows and to save her now by teaching her the incantations she has forgotten. 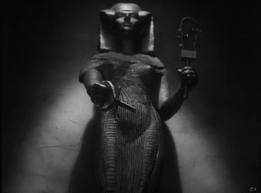 She begins reciting in ancient Egyptian and the statue raises its arm toward Imhotep. The Scroll catches fire and Imhotep is destroyed, crumbling into bones and dust. Karloff endured hours of make-up torture at the hands of Jack Pierce with magnificent results. 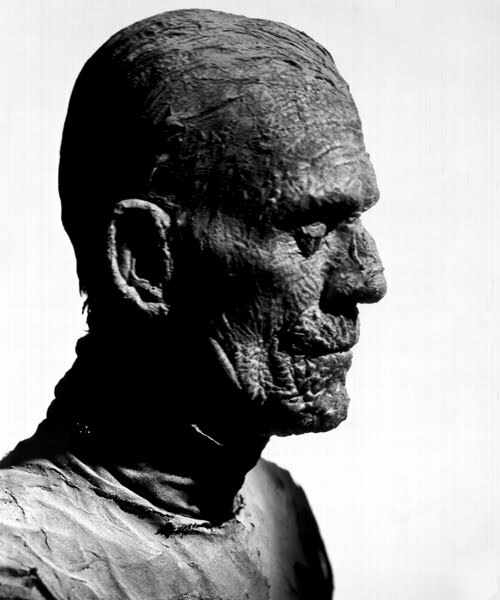 The make-up (both for the mummy and Ardath Bey) is undoubtedly one of the finest achievements in film history. The story moves along briskly with an intelligent and literate script. 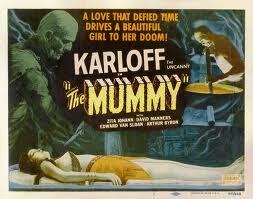 In addition, this was the first Universal horror to have an actual musical score. It is used judiciously and to great effect. For example, in the scene of the mummy’s awakening, there is no music whatsoever. This focuses our attention and heightens the suspense. The camerawork is smooth and mostly unobtrusive but is tarnished ever so slightly by two awkward setups. 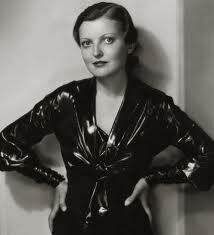 In one, as Helen looks out from a balcony she sees the pyramids, seeming to be only a few hundred yards away. She glances down and sees the city sprawling out around her for miles. It’s a very clumsy not to mention impossible juxtaposition. Just before this, we saw Imhotep at the museum, intoning the spell to bring the princess back to life. A rapid transition to Helen to show the connection between the two characters consists of a spinning diorama of the city. It is effective, however we see the same buildings rush past over and over, reminding us that we are watching something glaringly artificial. A bit of odd trivia - in the credits we see the name Henry Victor who played “The Saxon Warrior”. When Helen is being shown the vision of her past glimpses of her other reincarnated lives are shown to her, including a French noblewoman, a Saxon maiden, and a Christian in ancient Rome. These scenes were filmed, but then cut either by censors or simply for time. Keeping the name of a character that never made it into the final cut of the movie was a strange oversight. 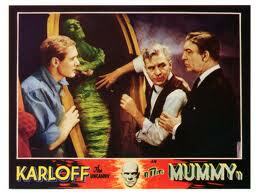 With the Mummy we now had the third of the first four great Universal monsters. "The Wolf Man" was still a few years away in 1941. (The greatest at least since the silent films and Lon Chaney, Sr.). After his sensational debut in “Frankenstein”, Boris Karloff had his first starring roles in “The Old Dark House”, and “The Mummy”. He became a star practically overnight at the ripe old age of 43, and a horror career was born. 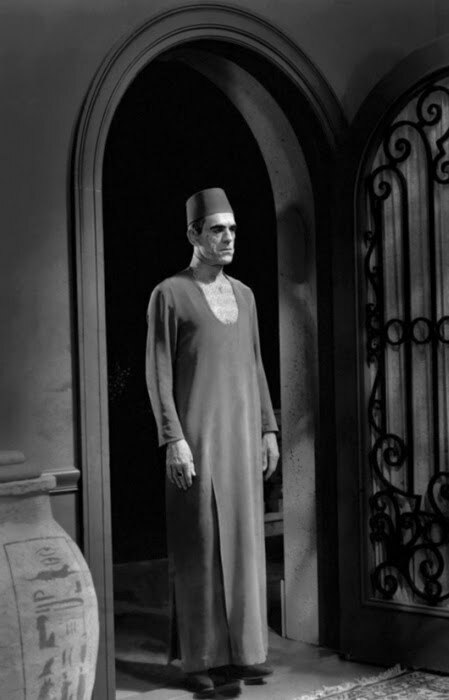 In this film he gave possibly his finest performance and created one of the most unforgettable, frightening, and yet sympathetic creatures in the movies – one who indeed has achieved immortality.